GARDEN GROVE, Calif. (AP) — Capitalizing on the emerging car culture of Southern California in the 1950s, the Rev. Robert H. Schuller started a drive-in church and built it into an international televangelist empire, symbolized by the soaring glass Crystal Cathedral and its weekly "Hour of Power" show. Now Schuller's life's work is crumbling. Citing debts of more than $43 million, the organization declared bankruptcy this week in a collapse blamed by some on its inability to keep up with the times and a disastrous attempt to hand the church over to Schuller's son. The church's failure to adapt to a changing landscape is ironic, considering that Schuller, now 84, was considered a theological radical during the Eisenhower years when he started preaching about the "power of positive thinking" from the roof of a concession stand at a drive-in theater. Followers could sit in their cars and listen to him through the movie loudspeakers that hooked to their windows. Schuller tapped into powerful post-World War II cultural forces that were reshaping America, said Scott Thumma, a sociologist of religion at the Hartford Institute of Religion Research. "What he was preaching was seen a pretty heretical to a traditional religious world view at the time. But it worked because that's where society was," Thumma said. "Society was in their car. They had a very positive viewpoint of the world. We had just come back from World War II, we were all having kids, we were all going to college. He tapped into those different streams in the culture and turned them into Christian expression." Schuller soon turned his humble pulpit into one of the nation's first megachurches, beaming his weekly Sunday service into 1 million homes worldwide through the "Hour of Power" TV show, which went on the air in 1970. Schuller became a familiar presence on television, a smiling figure in flowing robes, with snowy white hair and wire-rimmed aviator glasses. In 1980, he opened the Crystal Cathedral, a 2,900-seat see-through church made of 10,664 panes of glass. A $20 million architectural marvel designed by the acclaimed Philip Johnson, it became a major Southern California landmark and tourist attraction. Schuller soon added a K-12 school and a tourist center. Church leaders blame their predicament almost entirely on the recession, saying donations and ticket sales for their holiday pageants began to drop precipitously in 2008. The additions to the 40-acre grounds also forced the ministry to take out a mortgage that still carries a $36 million balance. Attendance has dropped about 10 to 15 percent at services at the Crystal Cathedral in the past few years but still hovers around 5,000 each Sunday, church spokesman John Charles said. A Spanish-language service attracts about 2,000 and is growing rapidly, and a new Arabic-language service has about 400 worshippers, he said. But those who have watched the church's fortunes decline believe Schuller — and later his children — failed to do much to attract younger people. Newer evangelical leaders like Rick Warren and Bill Hybels began offering hip worship services and an emphasis on social activism and the latest technology. Schuller got left behind, Thumma said. Schuller and family "stayed with the organ when everyone had gone to the rock 'n' roll band. He stayed with the robes when everyone else was reinventing themselves as bishops. In a time when most megachurces are going multisite and to smaller venues, he kept building bigger buildings," Thumma said. The church has recently joined sites like Facebook and Twitter (Schuller has his own account), posts inspirational videos on YouTube and offers the Spanish and Arabic services, but those changes may have been too little, too late. "I look at the 'Hour of Power,' and when the camera pans to the audience, it's gray-haired people," said Kurt Fredrickson, assistant professor of pastoral ministry at the Fuller Theological Seminary in Pasadena. 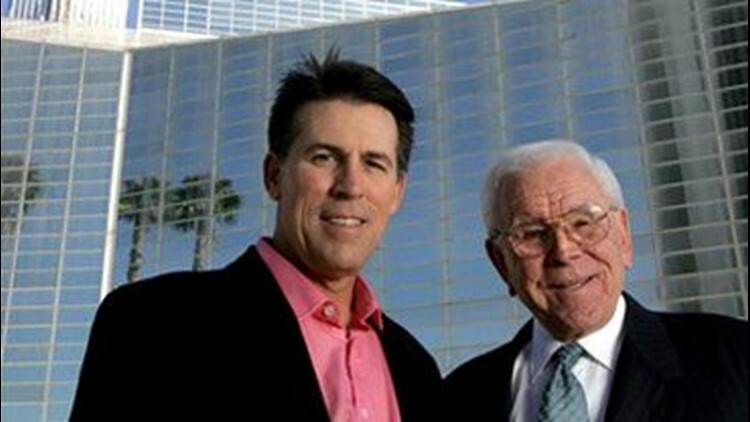 The Crystal Cathedral also alienated older worshippers with the ill-fated attempt to turn the church over to Schuller's son, Robert A. Schuller Jr. The much-heralded changeover ended in a bitter and very public family spat, with the younger Schuller disappearing from the "Hour of Power" broadcasts and abruptly leaving the church altogether in 2008, less than three years after he assumed his father's mantle. Last year, while announcing his own weekly TV show, Schuller Jr. said his father had resisted when he tried to introduce other media, such as cell phones and the Internet. Sheila Schuller Coleman, Schuller's daughter, has since taken over as senior pastor and presides over the "Hour of Power" broadcasts with a rotating stable of guest preachers, including her father. In the past two years, the church has laid off 250 of its 450 or so employees, sold its beloved retreat center, cut salaries and canceled contracts with more than 100 TV stations nationwide, Charles said. Family members took 50 percent pay cuts this year, the church spokesman said. He would not say how much they are paid. This week, the church filed for Chapter 11 bankruptcy, which allows a business to keep operating while it tries to put its finances in order under court supervision. The church said that for the time being, "Hour of Power" will remain on the air and the Crystal Cathedral will continue operating as usual. Charles acknowleged the church could have reacted faster to changes in worship styles, but said: "There's always a fine line we have to walk. We want to gain new members and we want to keep the older members, but some members say, 'I want it to stay exactly the way it is.'"